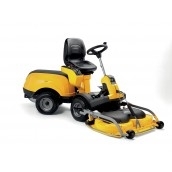 For larger domestic lawns over 2 acres and also light commercial applications the Park 740PWX with power steering, 4 wheel drive, electric deck adjustment, and the superb Briggs & Stratton vanguard twin cylinder engine is an ideal choice. Plus there are a whole range of optional decks and attachments that make this a year round workhorse, but the price here is for the standard machine with 110 cm (44") 3 bladed cutter deck. The Park 740 PWX 4WD is powered by a Briggs & Stratton Twin Cylinder Vanguard 18 engine developing 11.9kW, giving plenty of power to drive the electric Combi 110cm cutter deck. Hydrostatic 4WD transmission means that you have infinite speed control in either direction from a single pedal. 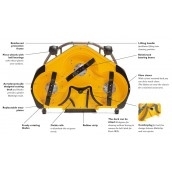 The PTO clutch is manually controlled from the seat and the fuel tank capacity is 12 litres. Imagine being able to trim under overhanging shrubs and into corners because your Multiclip cutter deck is positioned at the front of the machine where you can always clearly see it and it cuts the grass before your wheels have a chance to lay it flat. Only a 4WD Stiga Park can provide you with such an enjoyable way to maintain and improve your lawn and paddock areas, turning this chore into a ‘Drive in the Park’. The first thing that you should consider when selecting the correct 4WD Stiga Park for your needs is the type of cutter deck you require and this will determine the minimum power requirement for your particular machine; if you are concerned about access through gateways or narrow paths then add 10cm to the cutting width of the deck, this will be enough to allow you to drive your machine through the gap easily. For formal lawn areas with an occasional requirement for long grass cutting, our 95cm and 105cm ‘Multiclip Combi’ decks are ideal. If you need to regularly trim roadside verges, paddock/orchard areas or just have a large amount of mowing to do then our 110cm ‘Pro Combi’ would be more suitable. 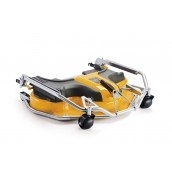 The ‘Multiclip Combi’ cutter decks can be used on all of our 4WD Stiga Parks and the ‘Pro Combi’ cutter decks should be used on models fitted with twin cylinder engines.